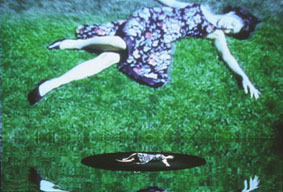 "Backed by obsessive, rhythmic tempos, by obscure descents into unknown abysses, by strange flights into quasi celestial heights, these media artists, these experimenters with high technology, lead their public on until their senses are totally bedazzled: hypnotic and overwhelming.… " Rafael Magrou, Techniques & Architecture (France). 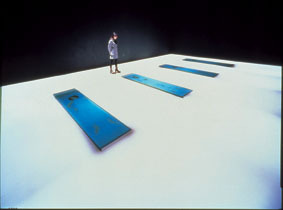 Installation related to the performance premiered in 1990, featuring a new kind of theatrical set: a central (trench' is swept by two constantly moving gantries controlled by computer. The original, uppermost gantry was fitted with surveillance equipment and slide projectors. Suspended close to the ground, the second gantry projected a bright light evoking the scanner of a giant photocopier. Presented for the first time from 20 January to 14 May 2018, as part of "ACTIONS+REFLEXIONS" (Dumb Type solo exhibition), Centre Pompidou-Metz (FR). Playback © Shiro Takatani The installation is inspired by Pleasure Life (1988). 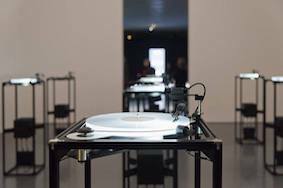 First presented in 1989, in a version featuring twelve turntables, Playback is an installation comprising a range of audio sources: music composed in the 80s by two Dumb Type members (Toru Yamanaka and Teiji Furuhashi), bizarre vocalisations on English language lessons and greetings recorded in a variety of languages from the data disc, to be sent into space aboard the NASA Voyager probe in 1977. Premiered from 20 January to 14 May 2018, as part of "ACTIONS+REFLEXIONS" (Dumb Type solo exhibition), Centre Pompidou-Metz (FR). 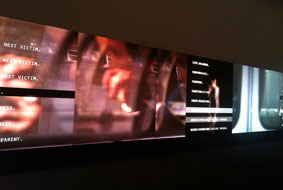 This audiovisual installation weaves visual imagery and sound from past works OR (1997), memorandum (1999) and Voyage (2002) together with new graphics on a huge ultra-high definition 4K vision screen. Presented for the first time at the Tokyo Museum of Contemporary Art, as part of the exhibition "Body/Leaps/Traces", from 27 September until 16 November 2014. 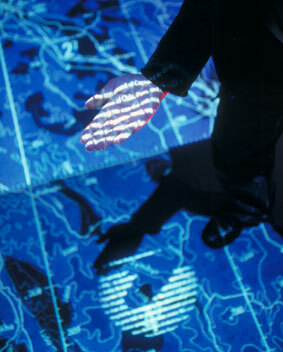 Voyages is the installation related to the performance Voyage (2002) and was commissioned by the NTT InterCommunication Center [ICC] in Tokyo in August 2002. "This overlapping of perspectives creates a sense of vertigo as if looking down on oneself from the air." Eiji Yamamori - Asahi Shimbun (Japan). The original version is part of the permanent collection of the ICC in Tokyo. The new version of the installation belongs to the Musée d'Art Contemporain in Lyons (France).